Personal, Household or Consumer Debt including mortgages. These figures are the national totals divided by population. The most common forms of consumer debt are Mortgages, Vehicle Loans, Household Item Loans and Credit card debts, although some quoted figures of consumer debt exclude mortgages, which is why I have tried to show both figures in the examples above. Some of this debt is that they call Good debt, borrowing to buy investments, but some is not good debt in that sense, as there is no intrinsic return on the item purchased. Unfortunately the average figures released, do not, as far as I can find, show the difference in the good debt and the not good debt. Consequently, the average figures can be very distorted. Looks bad, but if they own $1,000,000 in property, and a $1,0000,000 in shares, it can appear very different. But they still show up as someone in debt to the tune of 20x their annual income. But maybe they only own $50,000 or 10% of the value of the property. But they are only in debt to the tune of 5x their annual income. These two extreme examples show how personal debt figures can be very misleading. Example one has NET ASSETS after debt, of $1,500,000 but has a debt level 20x income. Example two has a NET DEBT of $450,000 yet ONLY has a debt level of 5x income. 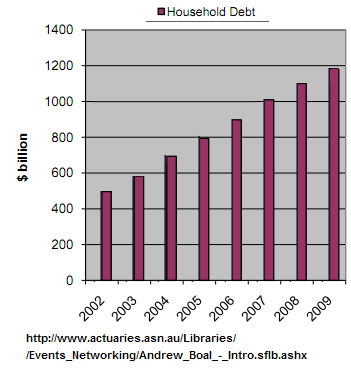 Source 3: RBA total debt figures show $1,099.1 billion for personal lending at table d5. Where is the Google Publisher Policy Report? Brexit is Happening. Does this mean War?